Gazans burn tyres in the hope smoke will protect them from Israeli snipers. Dozens of Palestinians were killed amid clashes with Israeli troops on the Gaza border in the bloodiest day for several years. Health officials said 52 protesters had died and more than 2,000 were injured by gunfire, tear gas or other means. The violence, the bloodiest since the Gaza conflict in 2014, came as a ceremony marked the controversial relocation of the US embassy from Tel Aviv to Jerusalem. The move has fuelled Palestinian anger and drawn foreign criticism for undermining efforts to find a peace settlement. A 14-year-old boy was one of six children among the deaths while a man in a wheelchair was also killed, according to the Palestinian Health Ministry. 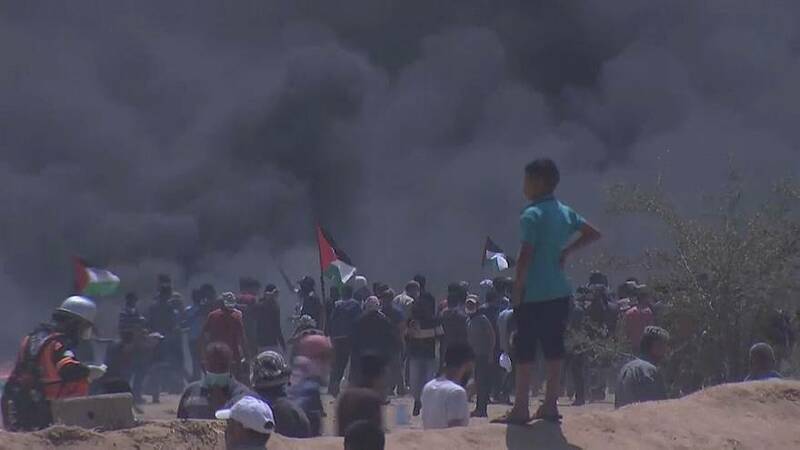 Earlier tens of thousands had streamed to the edge of Gaza's land border, some of the protesters approaching the Israeli fence. It is part of demonstrations that have been running since March and calling for Palestinians to be allowed to return to lands that are now in Israel. The bloodshed — the deadliest since late March — drew calls for restraint from some countries including France and Britain, and stronger criticism from others, with Turkey calling it "a massacre". The Israeli military said it was responding to violence from the protesters to defend Israel's border. In contrast to the scenes in Gaza, Israeli dignitaries and guests attended a ceremony in Jerusalem to open the US embassy following its relocation. Israeli Prime Minister Benjamin Netanyahu thanked Trump for "having the courage to keep your promises". "What a glorious day for Israel," Netanyahu said in a speech. "We are in Jerusalem and we are here to stay." Mid East conflict: What happens next?